I was a little grouchy last week. I spent one very warm afternoon watching the auto club guy try to jump my car battery by inserting something (attached to another battery) into the cigarette lighter. With my particular car, when the battery dies, the electric lock that opens the compartment where the battery lives, also dies. Genius. So it seems that lowly humans can not jump a dead battery, that job is restricted to the angel-like beings at the dealer. A picture of my niece, Christie (above) expressing her deep sympathy for me - Priceless. Speaking of family and fish, Sweet Do g Organics would like to help you share a little bit of the summer and the ocean with your Sweet Dog by offering a giveaway of two boxes of our BEACH DOG treats. 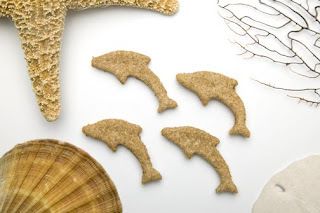 These fish shaped treats are made with organic wheat flour, organic wheat germ, organic flax seed oil, organic sunflower oil, free range organic chicken eggs, organic fish oil, pinch of salt and lots of love. Post a comment on this blog post (1 entry) and list your favorite dog blog or publication. It is very important that you include your email address so we can contact the winner. If you do not have a Google account, select anonymous. This contest has ended. Congratulations to our Sweet Dog Giveaway winner, Leah. Thanks to all of you who participated in the giveaway and support this blog. I really appreciate it! Check back for more great product reviews and giveaways.